”When I was driving into the circuit on race morning, it was absolutely seething with people," comments Johnny Mowlem - racing the Autorlando Porsche at Barcelona on Sunday (November 12). "I never expected a crowd like that – the official figure was 35,000 – it looked like a heck of a lot more! Clearly, Jesus Pareja and his GT Sport Organisation are doing something right – quite a lot right – in only the first year of the series. Johnny Mowlem has raced in nine of the eleven races, only having missed the first event at Monza, and with his experience in GT racing, he’s well qualified to comment on this thriving series. 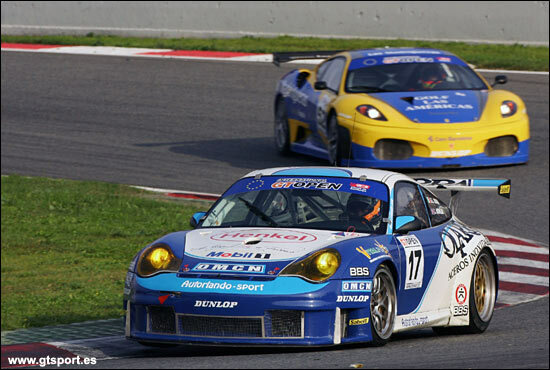 “They had 12 new Ferrari 430 GT2s and four Ferrari 360 GT2s at Barcelona for the final round – in terms of numbers it’s got to be one of the most competitive GT2 series in the world. When I did my first race in the series this year I went to Magny-Cours expecting a pretty easy run and being able to fight for the win, and we did. But I soon realised that given the number of new machinery out there, and also the level of the teams, that it was going to be much tougher than I thought! It's a true reflection on the growth of this series that at Magny-Cours, the second race in the championship, there were only two Ferrari 430s on the grid and 24 cars total: two days ago there were 12 Ferrari 430s and 61 cars on the grid!!" Within seven months it’s developed into an outstanding series, and next year’s calendar looks even better. Valencia, Magny-Cours, Monza and Barcelona are still there, but they’ve added Vallelunga, Oschersleben and Brands Hatch. How about that, a race at Brands? “The quality of the teams is high too. Leading LMS Ferrari team GPC looks as though it’s going to race in the Le Mans Series and the International GT Open in 2007, and Playteam looks as though it will do FIA GTs and this series. And let's not forget Autorlando, who actually won the LMS GT2 class this year. Having said that, you can get a true comparison of the level of competition between the LMS and Open GT series by looking at the fact that in the LMS, the Autorlando Porsche only had two or maximum three Ferrari 430s to deal with all year, and even then they only managed to out-qualify a 430 at the final round at Jarama. The 996 GT3RSR's strength is its endurance and I think it's fair to say that if all the LMS races had been only an hour long, it would have been much harder for a Porsche to win that championship. It's also an indication that Fabrizio de Simone and Peter Sundberg have between them had a few pole positions in LMS this year and yet normally qualify fourth or fifth in this series, so I think when you see drivers of their quality, and Ruberti and Giammaria who nearly won the only FIA GT race they entered this year, and who could only manage eighth at Barcelona, you get a clear picture that this is a strong championship, both in terms of teams and drivers.... and that's without mentioning the likes of Montermini, Mediani, Vilander, Pier Giudi, Gene, Giao, Bobbi just to name a few!!" The word at Barcelona was the Italian GT Championship won’t happen next year – which will mean that all the Italians will enter this series. It’s going to get stronger and stronger. Johnny Mowlem had a highly satisfactory end to his season, he and Gianluca Roda effectively taking a second (at one hour) place and third overall, with Roda ending up as the best placed Porsche driver – and his partner close behind (having missed Monza).